Being a Food Blogger comes with perks. My favorite? Mail days that bring new cookbooks filled with gorgeous photos right to my door. Such a day usually calls for an afternoon at the beach or an early stop in the pickup line as I simply can't wait to get my nose into the book. by Cara Reed, I couldn't decide. Hence... this is my second recipe (with permission!!) from this book, and to be honest, I'm wishing I could just start at the beginning of the book and simply blog my way through. Baking is my fist love in the kitchen, but I have to note here that I'm not a gluten-free baker. As I mentioned in our last post (Cara's Ginger Wafer Thins), Liv thought she didn't like "gluten-free stuff", but this book is quickly changing her mind. My son is severely lactose intolerant, and as such I'm are always looking for dairy-free recipes, hence I often turn to vegan sources and this book has become a new, highly praised source for me. 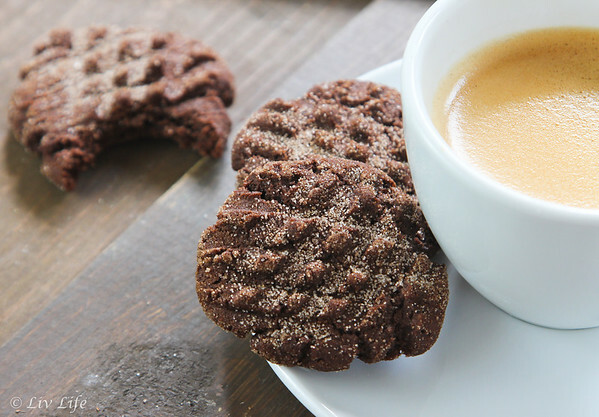 Tender and with a perfect snickerdoodle texture, these cookies bring what I think of as a Mexican Hot Cocoa flavor with the added cinnamon and chocolate. Perfect for an after school treat (if there are any left by the time the kids get home), I can also see these cookies on my holiday trays or wrapped in a little bag for a hostess gift. 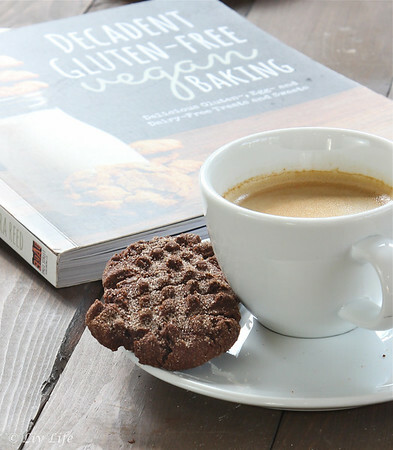 How perfect would a holiday gift of the book along with a bag of these cookies be??! Thanks Cara for letting me post two recipes from your book. I've got my eye on those Peanut Butter Chocolate Cupcakes next!! I think Cara says it best - "a fun twist on the classic snickerdoodle, this version bursts with cinnamon and nutmeg. The perfect melt-in-you-mouth cookie, it will make you believe you are drinking a cup of cocoa." Cara's Tip - the purpose of the cream of tartar in this recipe is twofold: it imparts a certain flavor that is ubiquitous with snickerdoodles, and it reacts quickly with the baking soda while in the oven, which allows for the dough to rise rapidly in the heat and then deflate just as swiftly, imparting that crinkle look we love about these cookies. Whisk together all of the dry ingredients except the sugar and cocoa powder in a mdeium bowl. With an electric mixer, beat the vegan butter, shortening and sugar until light and fluffy. Add the cocoa powder and the flaxseed soaked in water and continue to mix until fully combined. Stir in vanilla extract. Slowly add the dry ingredients into the butter mix until just combined. Chill the dough for 30 minutes in the fridge. Preheat oven to 350ºF/180ºC. Line a baking sheet with parchment paper or a silicone mat. Mix together the sugar and cinnamon for rolling in a small, shallow dish. For each cookie, roll into a ball with your hands (a heaping tablespoon's worth), roll them in the cinnamon and sugar and place on the baking sheet. Gently flatten with the back of a fork. Bake for 13-15 minutes or until edges are lightly browned. Remove from the oven and allow to sit on the baking sheet for 5 minutes before transferring to a cooling rack. "This is the all-purpose blend I use for practically everything. it is perfect for substituting regular flour on a one-to-one basis." 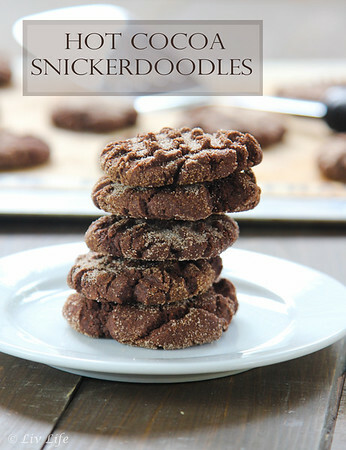 Loving the sound of a hot cocoa snickerdoodle cookie, these look great. Thanks for the recipe! Oh my goodness!! Those sound so good!